The quality of economic analysis from politicians is never good, but it becomes even worse during election season. The class-warfare rhetoric being spewed by Bernie Sanders and Hillary Clinton is profoundly anti-empirical. Our leftist friends genuinely seem to think the economy is a fixed pie and that it’s their job to use coercive government power to reallocate the slices. The only real quandary is whether Bernie’s sincere demagoguery is more disturbing or less disturbing than Hillary’s hypocritical attacks on the top 1 percent. Since I mentioned that the left’s rhetoric is anti-empirical, let’s look at the evidence. I’ve previously shared very detailed IRS data showing that the so-called rich pay a hugely disproportionate share of the tax burden. Let’s augment that analysis by perusing some data on income mobility. Writing for Money, Chris Taylor explains that America is not a land of dynastic wealth. But you don’t have to examine several generations to recognize that American society still has a lot of income mobility. Tami Luhby looks at how people move up and down the income ladder during their lives. The same is true for the super-rich, the upper-middle class, and the poor. The IRS looked at how frequently the same Top 400 taxpayers appeared on the list over a 22-year period ending in 2013. Some 72% ranked that high for just one year. Only 3% were listed for a decade or more. …While just over half of Americans reach the Top 10% at least once in their careers, only 14% stay in it for a decade or more, Hirschl found. …On the flip side, it’s not uncommon for Americans to spend some time at the bottom of the heap. Some 54% of Americans will be in or near poverty for at least one year by their 60th birthday, Hirschl said. Here’s a table of numbers for those who like digging into the data. Now let’s shift back toward public policy. The good news (relatively speaking) is that the politics of envy don’t seem to work very well. 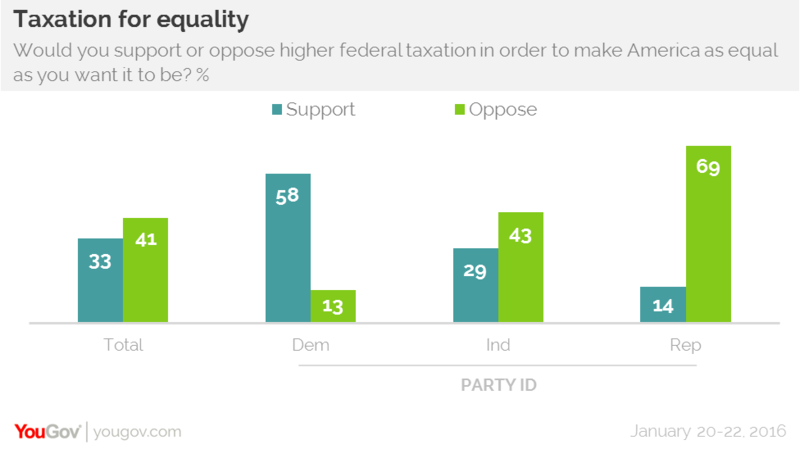 This polling data finds that most Americans do not support higher taxes (presumably from the rich) to impose more equality. And when you combine these numbers with the polling data I shared back in 2012, I’m somewhat comforted that the American people aren’t too susceptible to the poison of class warfare. Let’s close with some ideological bridge building. I certainly don’t share the same perspective on public policy as Cass Sunstein since the well-known Harvard law professor leans to the left. But I think he makes an excellent observation in his column for Bloomberg. Smart leftists should focus on how to help the poor, not demonize the rich. Bernie Sanders and Hillary Clinton have been operating within the terms set by Top 1 Percent progressivism. …For Top 1 Percent progressives, the accumulation of riches at the very top is what gets the juices flowing. They prioritize much higher taxes on top-earners, more aggressive regulation of Wall Street, restrictions on the compensation of chief executives, and criminal prosecution of those responsible for the financial crisis. Top 1 Percent progressivism emphasizes the idea of fairness — but it’s nevertheless a politics of outrage, animated by at least a trace of envy. It’s as if “millionaires and billionaires” were the principal problem facing America today. Sunstein correctly says the focus should be helping the less fortunate. Bottom 10 Percent progressives are not enthusiastic about concentrations of wealth. But that’s not what keeps them up at night. Their focus is on deprivation and lack of opportunity. They’re motivated by empathy for people who are suffering, rather than outrage over unjustified wealth. They want higher floors for living standards, and do not much care about lower ceilings. I’ve also argued that our goal should be reducing poverty, not punishing success. This is why I want pro-growth tax reform, a smaller government, and less suffocating red tape. Unfortunately, Prof. Sunstein then wanders into very strange territory when it comes to actual policy. He actually endorses the utterly awful economic “bill of rights” proposed by one of America’s worst presidents. If you think I’m exaggerating about FDR being an awful President, click here. And if you want more information about FDR’s terrible “bill of rights,” click here. So I like his diagnosis of why the left is wrong to fixate on hating success. But he needs to look at real-world evidence so he can understand that free markets and small government are the right prescription for prosperity. P.S. Here’s my video listing five arguments against class-warfare taxation. There’s a lot of material in a short period of time, though I think the most disturbing part occurs at about 4:30. What sort of person would actually want to impose tax policy that is so punitively destructive that the government doesn’t collect any additional revenue?!? Nedlabdp, how is that a dumb idea? Nedlandp, what are your thoughts about a flat tax of 20% on everything, personal income, dividends and capital gains and corporate profits? On the personal income, there would be $270, 000.00 threshold that would be exempt with a 20% rate applicable on any income above that dollar amount? You asked for my thoughts and I provided them. If you disagree please say why. Your confirmation bias is getting in the way of deliberative thought. It is a fact that the FairTax would benefit the rich and hurt the poor. It is my belief that a flat tax would be better, but it will take a substantial prebate/UBI to make it politically acceptable. And, if we’re going that route we should make it large enough to eliminate federal welfare and modify other safety-net programs. Nedlandp, don’t drink the Kool-Aid. Class warfare would, to borrow the Leftist language of class envy, be detrimental to economic growth. In theory the FairTax is wonderful, in practice it would be awful. Proponents say that everyone would get to keep their gross income. Whoopie! The problem is that the full tax burden must be added after everyone gets a huge raise, driving prices up. In FairTax the Truth the authors note that prices will go up across the board by 24.8%. Totally unacceptable. It would also be the wealthy, who currently pay the highest progressive tax rates, who would benefit the most. Those at the bottom who pay no income taxes would face severe inflation with no increase in take-home pay. I do like the idea of the prebate, but it is too little and it is based on family size. A UBI would be set at the poverty line, in order to eliminate federal welfare. It should be fixed by individual, one rate for adult citizens and one for children. Example of FairTax: An individual making $100,000 pays $25,000 in taxes. Under the FairTax, he would keep $100,000 for a 33% raise. However, his employer would have to pay $30,000 in taxes. New cost is $130,000, and 23% of that is $30,000. Nedlandp, what are your thoughts about a flat income tax or the Fair Tax? Liberals are motivated by power. Since wealth creation promotes individual freedom the last thing they want is economic success, unless with a complaint media they can claim the credit. Nedlandp, instead of arguing for wealth redistribution, liberals should advocate policies conducive to wealth creation. Based on their arguments about people paying their fair share in taxes, this is all the more reason for them to be advocating a flat tax or a national sales tax. Of course, high tax states would likely go bankrupt over low tax states, because low tax states probably convey the message that government should live within its means. A huge majority would agree that some redistribution of wealth is a good thing. While many would prefer that redistribution be done voluntarily through charitable organizations or personal involvement rather than government, there is a case for some redistribution for those in society that cannot provide for themselves. The problem with any redistribution method is that individual needs vary and no centralized system has enough information to match individual needs. If support is based on means-testing, you create a disincentive against work. The best answer is a basic income for citizens set at 100% of the poverty level that cannot be lost by earning income. Those without income would be kept out of poverty. Those with income would have the equivalent of a tax credit, which would provide reduced benefit as income rises. There would be no disincentive to work. Charities could then focus on those special cases, where the 100% poverty coverage is inadequate. To deflate the redistribution argument it is only necessary to envision extreme redistribution, where everyone receives an equal amount of the nation’s total wealth. One could not trade what they receive, because that would improve their relative standing, by exchanging what they don’t want for something they do want. What they would receive is real assets, not dollars. For example, someone might receive a 1/3 share of a 2 ton punch press, used for making auto parts. While in a free society that asset would have significant worth, in a society where everyone must be and remain equal, it has no worth at all. In fact, most of the country’s wealth would become useless. Clearly the facts support the fact that a significant faction of the American populace supports policy that enable Peter to rob Paul. The Democrats have made a fetish of the redistribution of wealth and today their true faces are revealed for all to see. Their candidates are two Marxists, or perhaps one Marxist and one Stalinist. Yet are the GOP any better. Their policies have placed the burden of taxes on 51% of the population as far as income taxes go. So why shouldn’t the 49% wish to see an increase in taxes. The solution is a simple Constitutional amendment that limits all government revenues to a 10% sales tax collected at the retail level. No user fees, specialized taxes should be permitted. Allow private industry to build roads and bridges. Thats how our forefathers did it. The younger generation has no concept of saving or retirement. Thrift is unknown among them. I have seen my counterparts tell how difficult they children have it, yet as a young married couple both have cars, laptops, cellphones, eat out five times a week for dinner, enjoy expensive vacations twice a year. No wonder they have difficulty making it. Champaigne tastes don’t go well on a beer budget. Our education system neither teaches our youth what capitalism is nor what socialism is. No student has a passing understanding of the stock market nor have even a simple grasp of social security. Sorry your column while it has good points goes off the reservation regarding the desire among the people to increase taxes. My property taxes are through the roof. They tax the air you breath.